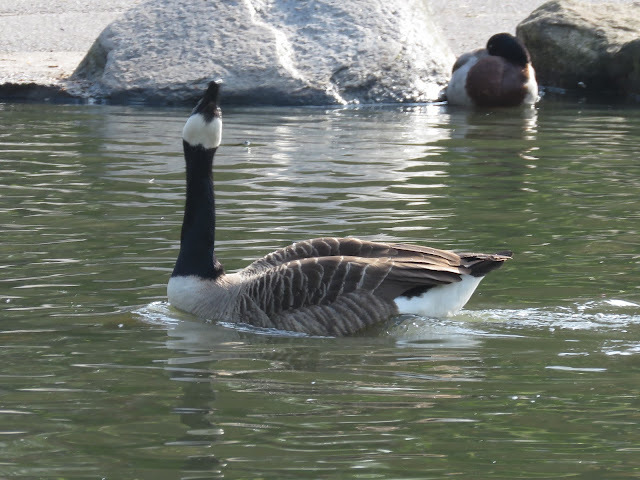 The Canada geese with a broken wing is now in the company of his partner in the park, who didn't leave with the flock in early March to their breeding grounds. He managed to retain two other individuals for a while - maybe offspring from previous years, as Canada Geese have long term family ties - but they ended up leaving. This morning, somebody started feeding the birds on an end of the pond, and I saw the pair of Canada swimming towards the feeding point. Broken Wing was leading his partner. He kept tossing his head every few seconds, and after a few tries I managed to capture the behaviour (above). It felt like a 'hurry up, follow me!' beckoning to female. Indeed, Canada Geese often communicate using head movements. I have covered the pre-flight head tossing, which is accompanied by much calling. When on land, and during the flightless phase of chick rearing during the moulting period, head-tossing by itself indicates readiness to walk or swim and is used especially when they are very motivated to move. Head tossing is very conspicuous due to the white cheek patch, and this is often directed to family members. Individuals head-toss when stationary, appearing to signal to other family members to follow them, including females to young goslings, and the signal is continued during movement. The direction at which the head is tossed is also informative, indicating the direction of movement. Even young goslings - who don't have the white patch - start head tossing in the first day after hatching, signalling their intention to move to other foraging patch. In a situation of threat, e.g. when a predator is located, this visual signalling allows parents to quietly direct their goslings to cover, avoiding attracting unwanted attention by acoustic signals. 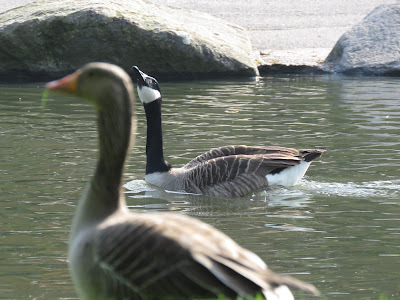 Jeffrey M. Black and James H. Barrow, Jr. (1985) Visual signalling in Canada geese for the coordination of family units. Wildfowl, 36, 35-41. Available here.